We have made the big move! Sunday, July 23 was our last day to pack before the movers arrived. We had left the kitchen until last, along with the bed and bedding. 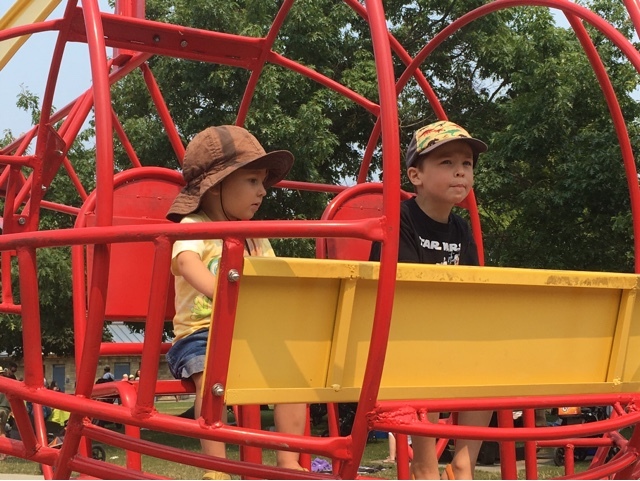 That weekend, Canada had a record heat wave. of course, it had to be the day that I packed up the kitchen! I packed the kitchen in 35 degree Celsius heat (95 Fahrenheit) with the sun beating in. Our house, which does not have air conditioning, was usually reasonably cool because of a long overhanging roof. But not on that day. On Monday morning, the packers from the moving company arrived. They spent the day packing all the fragile items: dishes, art, and electronics. Meanwhile, we finished packing the last of the bedroom and outdoor items, and packed the camper for our trip west. On Tuesday, the truck and driver arrived at 8:30 a.m. Four men loaded the truck all day, and they were finally finished at 8 p.m. at night. After they weighed the truck, we found that we had 16,000 pounds of stuff! By late in the afternoon, the house was empty enough that we were able to start cleaning. I began wiping down kitchen cabinets, while Rob vacuumed the basement. After the movers left, we went out for dinner, then slept in our camper in the driveway. The next day, we cleaned and scrubbed all day, and left the house shining. We finally set out on our journey west at 6 p.m. in the evening. We drove for a couple of hours, then camped near the BC-Alberta border. Another day of driving brought us into south central BC. Rob was driving the truck and had the dog with him, and I was driving the car, and had the cat with me. Because it was so warm, we couldn't stop for more than a few minutes during the daytime, as the vehicles became too hot for the pets as soon as the air conditioning stopped. We timed our lunch breaks to occur in high mountain passes where the air was cooler. We expected the third day of driving to be a short one. But we had not taken into account the the Friday bumper-to-bumper traffic that choked all the highways in the Vancouver area. It took hours to crawl through the lower mainland, and we finally reached the Horseshoe Bay ferry at 6:00 p.m. At the ferry, we were directed into separate lanes, as the truck is considered an oversized vehicle. Rob had a one-sailing wait, and I had a two-sailing wait. I finally arrived at my destination, our new home, Friday at midnight. We had a two-day break before the movers arrived on Monday to unload. It gave us time to deal with things like banking, see the kids and grandkids, and buy more hoses for watering the parched garden. On Sunday, before the movers arrived, I washed the floors throughout the house. On Monday morning, the moving truck arrived. They had a hard time backing from the street uphill into our driveway. The driver drove over some of the landscaping rocks, and scattered them down the hill. Four men unloaded for the whole day. They needed to come back again a couple of days later to finish putting the furniture together. We now have set up the most critical living areas, but still have many boxes to unpack. 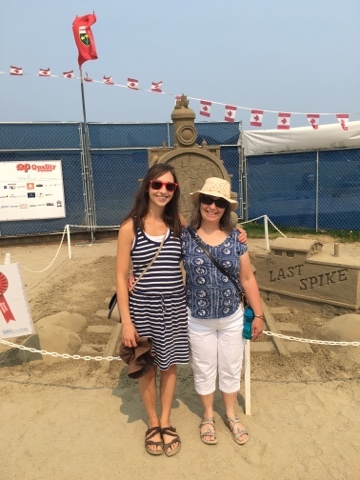 The first weekend, I took time out to go to the Parksville Sand Carving competition. We are so excited to to have finally made the move! We love our new house, and are thrilled to be closer to some of our friends and family. And now, after only twelve days in our new house, we have left the house in the care of of my son, and have headed off on another adventure in the truck and camper! Love the living room! The floors are gorgeous. Just reading about your adventure sounds exhausting. I can only imagine living through it. Wishing you the best as things come together for you in your new home/life. 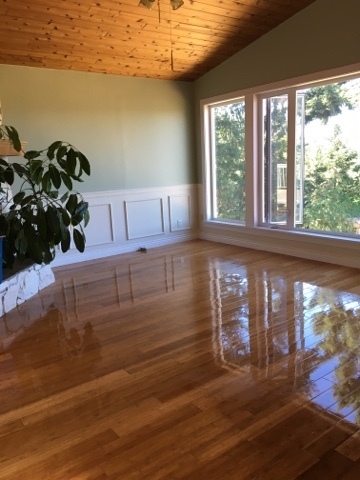 Yes, the beautiful hardwood floors are a feature of the house that we really like. Thanks for thinking of us, Carole. Moving certainly is a huge upheaval -- not an experience I would like to repeat often. But it is great to have finally moved in! I'm so glad that you wrote, Jude. I've been wondering how you are doing and how the move went. It sounds like you had an excellent moving company. They, and you, did very well throughout although I'm sure everyone was beyond exhausted at the end of each day. I hope you're enjoying your latest adventure and look forward to a post about it when you return. The move did seem to go very well until halfway through the unloading process. Then we discovered that several items of furniture had been damaged, and the floors were scratched in several places. So, that was disappointing. However, we are really happy with our new home and looking forward to really settling in. Right now we are travelling, and I will write about it when I get a chance. I have not had a chance to keep up with writing -- or reading -- blogs much this last few weeks. It's terrific that your move is over (except unpacking) and you are already enjoying your family! And going on camping trips too! It's great that you are taking advantage of the season. The boxes will still be there when you return. The boxes will be there -- truly stated! 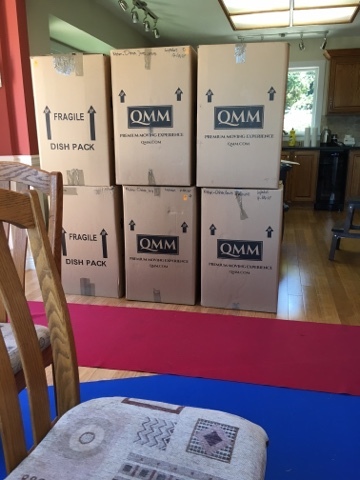 In some of my previous moves, some of the boxes never did get unpacked, or, not until I began downsizing in preparation for this move. Let's hope we do eventually get everything unpacked. I hope your renovations are going well. It is such a busy time for you, Vicki. What gorgeous hardwood floors, Jude! I can't wait to see the rest of your new home. I look forward to catching up soon. Thanks, Donna. We currently are travelling (after only twelve days in our house). But we'll be back soon and are looking forward to settling in. Meanwhile, you are having an adventure! So on 23rd July we were in Drumheller - not so far apart! (Belated) best wishes for your new home adventure. Annabel, I love Drumheller. The Royal Tyrrell Museum is amazing! Dinosaur Provincial Park near Brooks Alberta is another favourite. We are glad that we had the chance to see them while we lived in Alberta. I hope you enjoyed your visit there. We did, thanks - we visited both the Royal Tyrell and Dinosaur PP. Will be writing about them some day. Anabel - I spelled your name right in the response above, but autocorrect changed it. Sorry. Autocorrect always thinks it knows best! I think I have mine trained to spell my own name now, but don't worry. I have spent a lifetime responding to any spelling and, indeed, to any fancy name beginning with A.
Haha, that wretched autocorrect is hard to train. Thanks for your comment. Now that we are well settled in, it is interesting to look back and remember the stresses of moving. Thanks for your comment. I am happy to say that almost all of our boxes are unpacked now. Of course, the boxes should be unpacked by now. We have been here for almost two years.